Restaurant Simple and innovative cooking where it is possible to get the subtle balance between rustic and elegance which is the same spirit of the countryside. 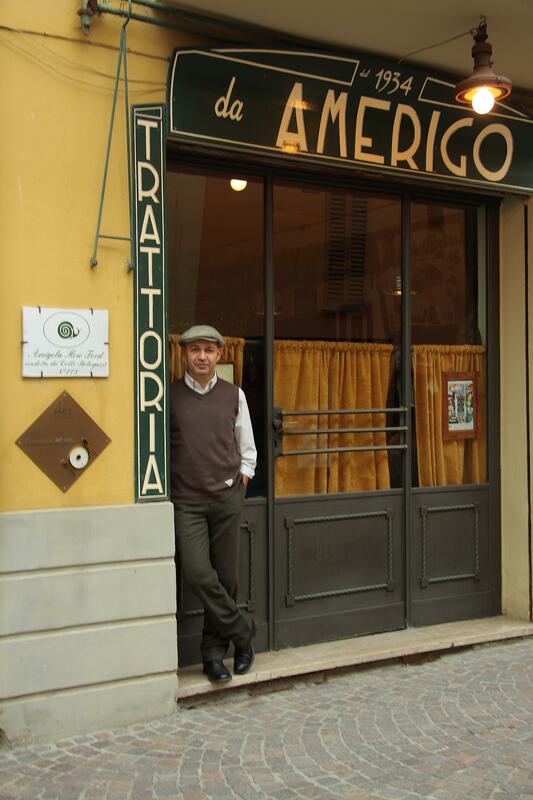 Amerigo and Agnese, Patron’s grandparents, opened the Trattoria in 1934. Now as then, the local is the reference point in the valley, a well-known rustic restaurant with Emilia-Romagna speciality, now the third generation of hosts . In 2003, with the expansion of the Locanda, the host proposed again, in modern key, the idea of a hospitality that the grandparents had seventy years ago. Five rooms of Amerigo have been restored by Paolo Fiorentini, an expert interior designer who ranged between modern and ancient design. Every room is different and hosts works and objects of several artists from ‘900 italian designer as Gae Aulenti, Fontana, Venini, Barovier & Toso, Castiglioni, Roviello, Galli, Magistretti. The Buildings Amerigo Locanda it is an historical abode, which her first part born in 1934, composed by: a Restaurant - Trattoria qualified in basic dishes of truffles and porcino mushrooms, a Locanda with five rooms and a Pantry, where it is possible to buy the typical products of the Emilia-Romagna hills. In one of the feedbacks written by a gentle guest, we can read: “there are 300 m between Locanda and Trattoria, and it is good because a stroke before dinner it is wet and after dinner induce to sleep, because you walk around the village rich of butcher shop and historical banners. Rooms Amerigo Locanda is like an hotel with an Art Decò style, ancient wood finish and walls of rock. The owners love to call her “home” because it is a comfortable location, well-finished. Each room has different furnishings and design and equipped by TV, private bathroom, internet connection, free wifi. Rooms are located in three floors and they have not the access of the elevator. You can have Breakfast in the bar of Piazza della Chiesa: it is a classical breakfast with good coffees, brioches and bakery. The Gastronomic proposal “Seasonality means pander the times of the nature with dishes which rest in the menu only for few days and others for few month. The important is to catch the substance in the better time of his cycle; only in this way you can find the authentic flavor in your table”. This is the meaning of Trattoria’s cooking: from one side, some dishes tied to the period of the year, from the other side another traditional menu, like that of White Truffle, always first matters, dishes, local preparations rigorously seasonal. The strong point are mushrooms and truffle dishes, in which aren’t used oil, butter and sauces, products with chemical herbs, frozen or brine mushrooms. The owners are very cheerful to call into question, restoring periodically and standing faithful to the road and to the history that they have chosen. Wines Rich of tag’s selection which represented the territory of the region, as Colli Bolognesi and Emilia Romagna’s wines, everyone are availables just only like a glass, with the target to represent a territory and an original idea of the wine, outside of the stereotypes and fashions. The ending menu counts around fifty tags, also with the possibility to take stem glass. Wines sit, all year, at 15° C of temperature and 70% of damp. The Products The pantry offers good handmade spirits, sauces, cheese’s creams in box and preserves with beautiful retrò tags with Amerigo 1934 brand, which are inspired to the ancient tradition of the farming family. They are prepared in their laboratory of Monteveglio, without the using of herbs or chemical products, so closing inside the box authentic flavors, on the basis of the philosophy of the respect to the seasonality and the first local matters, inspiring to the Trattoria’s recipes. The products can be proposed like tasting for eno-gastronomic events and they are an original and good gadget to offer in case of companies’s events and teams in Locanda. Itinerary, Courses and Guide Visits The building offers free bicycles to explore Savigno’s surrounding hills, a place near Bologna and Modena, two important cities to visit from the artistic and historic sight. Moreover there are some natural itinerary by foot and by bike following marked track. There are organized visits to wine producers of Bolognesi hills and in the area of Lambrusco, to Parmigiano-Reggiano zone, to the Modena zone of Traditional balsamic vinegar and local cured meats. For small groups they organize small courses about breads, “tigelle”, pasta, truffles, mushrooms, game, courtyard animal and fish of freshwater, accompanied by expert gatherers.